Large breeds, such as Dogues, are prone to issues with the bone structure and hips as well as weight issues. As puppies, their growth should be carefully controlled so there’s no stress on the immature bone structure and the concern with weight goes well into their adult and senior years. A Dogue De Bordeaux, otherwise known as a French Mastiff, is a large breed most well known for stealing the show in Turner And Hooch. This breed is loyal and territorial, and they’re older than their country of origin, France. They’re a powerful large breed, reaching weights of up to 110 pounds and because of their massive size aren’t usually the type of dog suitable for the first time dog owner. Those willing to work with their stubborn streak are rewarded with a fiercely loyal and affectionate companion. They’ll need special attention to diet as a large breed, so let’s find out just how to build a comprehensive diet for maximum health. Food should be nutrient dense to provide all the proper combinations of whole proteins with complex carbohydrates and other vitamins but without adding extra calories that can cause unnecessary weight gain. Foods with premium kibble sources with top of the line ingredients will help keep your Dogue de Bordeaux in food health while possibly reducing the overall cost of vet visits down the road. A large breed dog has specific health concerns associated with the size, but there are a few things to consider specific to this breed. Let’s take a look at the top three things you need to watch out for and how food may help relieve those issues. Large, barrel-chested breeds are prone to a life-threatening condition called Bloat. The stomach suddenly distends and twists causing pain and eventual death if not treated immediately. Good quality foods may help to reduce the chances of bloat because you can feed your dog’s smaller meals without sacrificing overall nutritional requirements. Although a genetic condition, the effects of hip dysplasia can be mediated by maintaining weight and using foods with joint support supplements. Chondroitin and glucosamine help preserve the integrity of the joint and replenish the cushioning. Also, foods with proper protein amounts can help keep muscles in good shape to better support the joints overall. This breed is prone to ear infections and skin irritations, so reducing the number of food allergens could be critical to better digestion and staving off those inflammations. Common culprits are corn and soy products plus artificial flavors and colors. Foods with whole proteins and good sources of essential fatty acids should help the skin and ears stay clear. The primary ingredient for all dog foods should be a complete, quality protein from a whole source. Deboned chicken and turkey are lean examples while duck or beef offer fattier options for dogs with allergies. Combine those proteins with complex carbohydrates that don’t spike blood sugar, and you’ve got a food with all the proper nutritional building blocks. Fruits and veggies offer vitamins and minerals plus antioxidants that support the immune system and help with digestion. Fiber content should be enough to promote healthy digestion and maintain proper weight. For large breeds, sources of glucosamine and chondroitin will help support joints to keep them in optimal condition throughout life. Essential fatty acids are helpful for growth, support coat, and skin and keep brain development on track. Using cheap fillers may bring down the overall cost of the food, but it wreaks havoc on your dog’s digestive system. Corn and soy are two common fillers responsible for allergic reactions, skin, and unnecessary weight gain. Another is poultry by-product meals, cheap sources of proteins. They shouldn’t appear on the ingredients list at all. Artificial colors and flavors are another no-nos. They make the food look nice for you, but they can cause reactions and digestive issues as well. You should avoid foods that use any artificial flavors or colors in addition to fillers. One issue we’re just finding out about is the relationship between diets high in potatoes, peas, and legumes and a condition of enlarged heart called Canine Dilated Myopathy. We aren’t sure of the exact link yet, but it’s best to discuss with your vet whether you should avoid foods with these ingredients outright. We recommend paying attention to foods that list any of those ingredients in the first three positions. We don’t like naming names, but some of these brands are frequent offenders with our ingredients to avoid list. They may look attractive from a budgeting standpoint, especially since you’re feeding a large breed dog, but don’t fall prey to their marketing tactics. Purina Beneful: This food may have veggies and whole meats on the front of the bag, but many of their ingredients lists use corn or by-product meals as part of the ingredients. Ol Roy: Corn, soy, by-product meals, you name it. It’s a lot of food with a tiny price tag, but that’s about the only good part of this food. The rest is a nightmare. Kibbles N Bits: You may think this is a heritage brand, but they have all the ingredients we’ve listed, corn, soy, by-product meals, artificial flavors, and artificial colors. Don’t do it. The Dogue de Bordeaux reaches an average of 110 pounds or more, and to maintain this weight will require more food than the average dog. 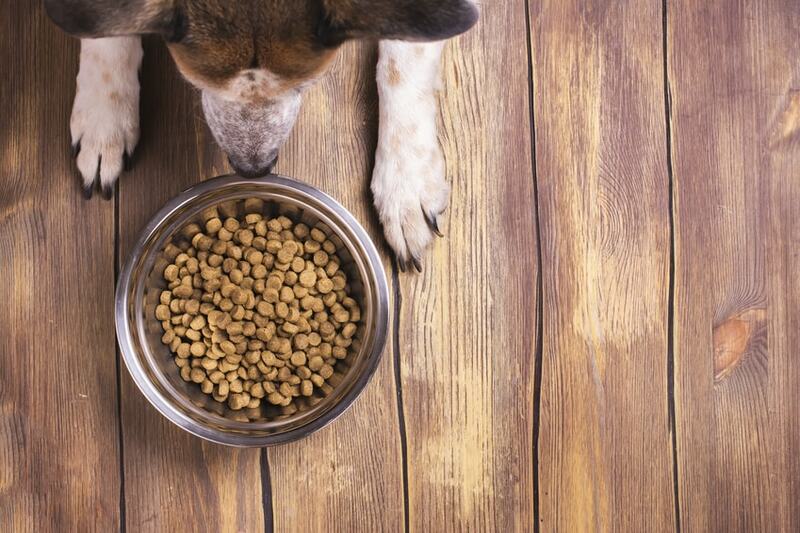 You can expect a minimum of a 50-pound bag of dog food per month in your calculations. Puppies: Puppies will change a lot during a period of rapid maturation, but the biggest thing to remember is that large breed puppies need controlled growth to avoid potential skeletal and joint issues down the road. Your vet is likely to change feeding recommendations several times until your puppy has matured. Adults: Adults will likely have around four to five cups of food per day divided up over smaller meals. The largest adults (140 pounds or so) will need nearly 3000 calories per day. Seniors: Older dogs receive a lot of the same nutrition they did when younger, but if your dog shows signs of inactivity and possible weight gain, your veterinarian may cut back food portions to account for the difference. Your large breed dog has specific needs related to weight and musculoskeletal structure. A densely nutritious food has no empty calories, none of the most common food allergens, and plenty of complete proteins sourced from whole ingredients. It may be more expensive upfront than that bag of Ol Roy, but trust us, you’ll probably save money with vet visits and health issues in the long run. Let’s look at our top picks. Merrick’s unique formula uses bits of freeze-dried raw meat to encourage dogs to eat and give texture and taste interest. That extra burst of protein is excellent for a muscular, large breed dog. Glucosamine and chondroitin support joint health while essential fatty acids help keep skin healthy. Merrick’s dedication to providing the closest thing to an ancestral diet is admirable. The company tests all recipes in its own test kitchens to produce high-quality kibbles and formulas for a wide range of life stages. Taste of the Wild offers a grain free option that’s great for helping your Dogue de Bordeaux maintain a healthy weight and avoid further allergic responses. It uses wild salmon, a lean source of quality protein and fatty acids essential to skin and coat health. Whole fruits and veggies support the immune system and digestion with proper vitamins and antioxidants. Taste of the Wild uses state of the art facilities to create their recipes for optimum health for your Dogue de Bordeaux. They’re part of the family-owned Diamond Pet Food Company, and each of their formulas helps your dog receive the dense nutrition essential for life long health. NomNomNow gives pet owners the chance to feed their pets human grade food without switching to a messy raw food diet. Tasty Turkey Fare is a healthy option, offering whole proteins through cooked turkey plus plenty of vitamins with whole fruits and veggies. The meals are made and arrive at your house ready to serve or freeze for later. NomNomNow was founded by a veterinarian looking for a better way to get proper nutrition in the hands of pet owners. The company is a good balance between store-bought kibble and the confusing raw food diets. Fully cooked meals using human grade ingredients in a limited ingredient formula. It’s simple, arrives fully ready to serve, and keeps your Dogue de Bordeaux happy and healthy. Large breed puppies need to have growth carefully controlled to avoid causing huge issues with joints and the skeleton. Foods should be explicitly formulated for large breeds so that you know you’re giving your Dogue de Bordeaux the best nutritional start. Wellness uses complete proteins with balanced carbohydrates to keep up with all that puppy energy. DHA helps keep brain development on track and calcium supports growing bones. It even contains an extract to help reduce odor in your puppy’s stool, a common complaint among puppy owners. Wellness is a pioneer in pet holistic nutrition, evidenced by their wide range of recipes designed to provide optimum nutrition. Extra little supplements help increase your puppy’s standard of living while still providing the core of healthy ingredients and nutrition requirements. Nutro’s wet food proves you don’t have to choose between a formula for large breed puppies and wet food. It uses whole lamb for good protein sources that can keep up with your puppy’s growth plus plenty of fiber and carbohydrates. It’s suitable as a meal on its own or as an additive to your puppy’s kibble. Nutro was originally only available in specialty stores, but the company has expanded to get premium nutrition in the hands of pet owners more easily. It has a wide range of high-quality foods and recipes that span your companion’s whole lifespan. Seniors need the same dense nutrition as their younger friends, but weight control should be top of the list for this giant breed. Making sure weight stays at optimum levels and providing joint support should help your Dogue de Bordeaux maintain an excellent quality of life well into the twilight. Now Fresh’s recipe is formulated for large breed seniors that need some extra help keeping that creeping weight off. It uses premium proteins from quality sources such as deboned turkey plus glucosamine and chondroitin from New England green mussels. It’s grain free and free of fillers to alleviate allergies. Now Fresh may be a smaller company, but they offer pet owners a premium kibble that helps keep up with aging dog’s changing health and nutritional needs. It may be more of an investment, but it’ll pay off in the long run. Blue Buffalo’s wilderness line has plenty of whole proteins and carbohydrates to help maintain your Dogue de Bordeaux’s energy levels without adding extra weight. Glucosamine and chondroitin support joint health, and essential fatty acids help reduce inflammation in the skin. It mimics your dog’s canine ancestral diet and may help keep cognitive function at its peak. Blue Buffalo was inspired by the search for the perfect diet for Blue, an Airedale Terrier. Blue Buffalo’s formulas are created to help your senior dog maintain a healthy lifestyle and a robust cognitive function. Your Dogue de Bordeaux needs good protein sources and joint support as a large breed dog. From the puppy years to the golden years, controlling weight gain and rapid growth will give your Dogue de Bordeaux the best chance at maintaining a healthy muscle mass and skeletal structure. It’s important to talk to your vet to get specific recommendations for your individual dog, but you can be assured that investing in your dog’s nutrition now will likely save you a lot of money in the long run when it comes to overall health and vet visits. Keep your adorable giant happy and healthy for years to come.